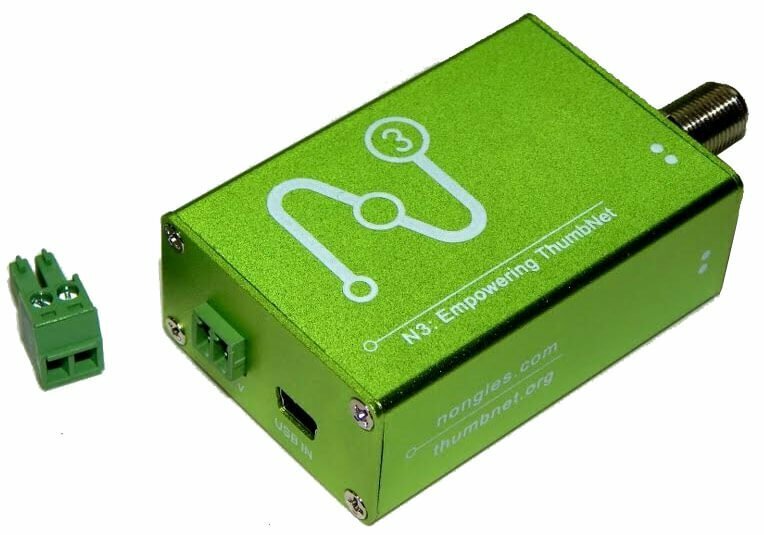 Back when it was released in November we posted an initial unboxing and initial first impressions review of the ThumbNet N3 RTL-SDR dongle. In this post we continue that review and post a few more in depth results. 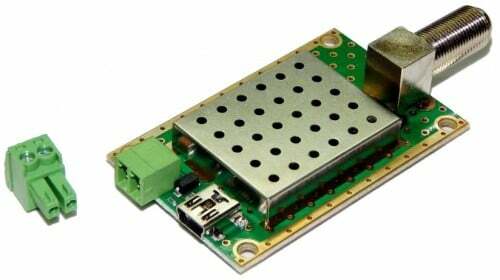 The ThumbNet N3 is the latest iteration of ThumbNet redesigned RTL-SDR dongles. It’s main features include a shielded PCB, metal enclosure, F-type connector, Mini-USB connector, all linear power supplies and an external power mode. It is designed specifically to be used in the ThumbNet system, but because they need to order the units in bulk they sell the excess off to other users too on their new site Nongles.com. The N3’s list of features is shown below. ThumbNet/ThumbSat is a company that hopes to help experimenters get mini satellites into orbit starting from $20k USD. The ThumbNet project aims to provide hundreds of schools and educational institutions with RTL-SDR based satellite receivers in the hope that they will use them as an educational resource, and at the same time help set up a worldwide monitoring network, so that the live data from the launched satellites is always available to the satellite experimenters. The N3 comes in several cost options. Build: The sample we received was the premium option, including the aluminum case and RFI screen. As mentioned in our previous initial and unboxing review the case is very rugged and has walls about 1 mm thick. Since there is no USB-A connectors sticking out there is almost nothing that could conceivably break if the unit was to be abused. The F-type connector is secured to the case via a nut. The external power port uses a removable Phoenix plug, which has screw terminals. The logo is nicely laser etched into the green metal and all the connections are clearly labelled. Enclosure and Screening: Ordering both the RFI screen and Aluminum case seems a bit redundant since they both perform the same function, but double screening might reduce local interference a bit further. It might have been better if the RFI screen had been designed to shield the RF section of the PCB only, as then it would have been shielded from the more noisy digital section of the PCB. USB Connector: The N3 uses a mini-USB connector which is sturdy and unlikely to break. Mini-USB connectors are however already depreciated already in favor of micro-USB, but to be honest we do prefer mini-usb connections over micro-USB as they seem sturdier. The mini-USB connector is held on only by surface mount soldering, so it may be possible to break it if enough cable strain is applied, but this seems unlikely under normal usage. Current Draw: The current draw is about 400 mA, which is about 120mA higher compared to a standard dongle. This higher current is due to the use of a linear 1.2V regulator which is used in place of the switching regulator found on most standard dongles. A linear power supply is much quieter in terms of RFI generated, but uses significantly more power. We’ve recently see that some other RTL-SDR hardware designers have gone the other way, adding more switch mode power supplies to create a low power dongle, at the expense of more noise. First we did some noise floor scans. We used rtl_power and connected the N3 to a dummy load to ensure no external signals were present. The results show that the ThumbNet N3 has a very low noise floor compared to other dongles. Like in our post which tested the prototype the N3 still has some large clock spurs visible, but these clock spurs are generally not a problem unless one happens to fall exactly on top of a signal of interest. Here we compared the ThumbNet N3 against our RTL-SDR Blog V3 unit on several side by side comparison images. The units were connected via a two way splitter to a discone antenna and both were run on the same PC. Most of the time the two dongles seem to perform very closely, but the N3 does seem to have about 1-2 dB higher SNR in most tests. At L-band frequencies the N3 was however about 1 dB less sensitive, although the N3 had a much lower noise floor, which was surprising as the noise floor appears identical at 1.5 GHz in the noise scans. In the tests we adjusted the gain settings to try and achieve maximum SNR on a target signal. Most of the time this occurred at the point where the two noise floors matched. However, in the L-band test we put both gains at maximum settings. In the last image we tested shielding performance on broadcast FM signals. We tested in an area with very strong broadcast FM. No antenna was connected to either dongle, and a dummy load was used. It was found that the N3 with its shielding can and aluminum case had a bit less interfering signals coming through which is good. This test can be seen in the last image on the image slider. Many cheaper RTL-SDR units have a problem receiving signals at L-band, from about 1.3-1.5 GHz and above. This is because as they heat up a problem in the charge pump circuitry develops which causes the dongle to be unable to lock above a certain frequency. This is solved by better thermal design and cooling, such as what is implemented in our V3 unit. The N3 also has excellent thermal design and does not experience this problem, as far as we can see from our test unit. One of the main attractive features of the N3 is the ability to power it via external power. The external input takes 5V and is rated to take up to 6V at most. We tested this feature with both a standard switch-mode 5V AC-DC power adapter and a 5V phone charger lithium battery pack. The external power is connected through a screw terminal block, so you will need to strip some wires for whatever power source cabling you are using. For battery power via our portable lithium phone charger battery we took an old USB cable, cut it open and exposed the copper on the RED (+5V) and BLACK (GND) wires. 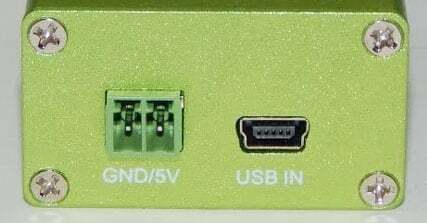 The ThumbNet unit is clearly labelled with GND/5V on the enclosure, and you do need to be very careful with your connections as using reverse polarity could damage the N3 and/or your USB port. ThumbNet N3 running via a lithium battery pack. In terms of operation, the external power feature worked flawlessly. As soon as the external power is plugged in the current usage (as displayed on a USB current meter connected to the USB connection) drops to zero. The power can be connected and removed at will from the N3 without disrupting the operation of the unit. The external power feature may be useful for powering the unit at the end of a long USB cable, or to avoid over taxing low power USB ports such as on embedded computers like a Raspberry Pi. This may let you run multiple units from one USB controller or one Raspberry Pi without running into power restrictions. However, a powered USB hub could also be used for the same purpose. When it comes to noise floor and spur differences between USB, AC Switch Mode Power and Battery Power, we didn’t see any noticeable differences. A noise floor comparison is shown below. The effect may be more prominent on USB power supplies which are more noisy. Perhaps the USB power supply in our test PC is already quite clean. Noise Floor Scans with USB Power, AC Power, Battery Power. One problem with the N3 is that it draws almost 400 mA of current, which is compared to the 280 mA used on a standard dongle. Therefore, on a long 15 m active USB extension cable the N3 failed to operate, instead producing an odd failure mode with a single large wideband signal shown near the middle of the frequency spectrum at all frequencies. This was because the voltage at the end of the long USB cable had dropped to about 3.1 V. The RTL-SDR needs at least 3.3 V to operate normally. A higher current draw means that more voltage will be lost in the USB cable due to the electrical resistance of the cable. In comparison the V3 dongle was able to operate on up to 25 m of USB cable (two active extension cables joined together) without trouble. Standard dongles did not work on the 25 m cable as the regulator they use has a higher voltage drop out point. However, the N3 has the ability to use external power, thus eliminating any USB voltage drop problems when this feature is used. 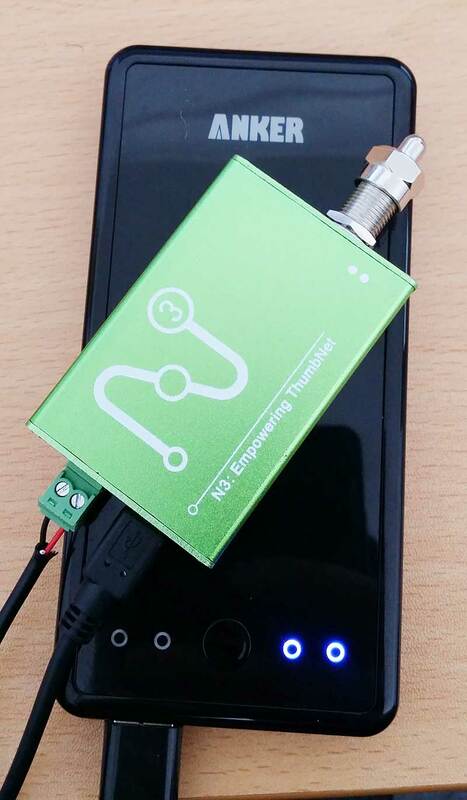 With the external power connected the N3 operated perfectly at the end of 25 m and even 30 m of USB cabling. Conceivably it may be possible to extend the USB length even further with more active USB cables (which need to be used to overcome packet timing requirements), since voltage drop in the USB cabling is not a problem with external power. Recently Akos from the radioforeveryone.com blog also received and tested a ThumbNet N3 unit. However, while he was testing the unit on battery power something went wrong and something caused two USB ports on his laptop to permanently stop functioning. Most USB ports should have a resettable PTC fuse built into their circuitry, but in Akos’ case it seems that these did not kick in fast enough, or were simply not present. Needless to say he wasn’t very happy about this, and returned the ThumbNet N3 for testing. Update 18-Dec-2016: The incident report from ThumbNet is now available on a new post by Akos. Over-voltage on +5v in. In extreme case, may cause 3V3 LDO to overheat and capacitors and ICs to fail. Ground loop through N3. Extreme case may cause power supply over-current, PCB damage. Re-advise users about voltage limits the requirement for correct polarity. Advise users to mate power supply wires to the Phoenix plugs first (after checking polarity and that there are no stray wires) and then routinely using the plug and socket to attach power, rather than repeatedly removing wires from the terminal blocks. Additionally, this avoids the issue of connectors obscuring the +5V and GND symbols on the N3 case. Advise users that, as with many electronics that are used for experimentation, it is advisable to use power supplies (including USB ports) that contain their own protection (thermal resettable fuse or over-current trip). They are also adding in a reverse current protection diode into all future production units just in case. Later upon receiving the returned unit they found no problems with the unit in question. The N3 that was involved in this incident was passed directly to the test engineer without any intermediate handling, and was found to be functioning correctly, with no damaged components. Current draw is 405mA. In our own testing we did not experience any problems with the external power feature when run with an AC power pack for several hours or when run on a battery pack for over half an hour. Overall the ThumbNet (with aluminum case option) is a sturdy and rugged package. The improvements implemented are not ground breaking, but you can expect about 1-2 dB’s better SNR, a lower noise floor, and better shielding from strong interfering signals. In our tests the external power mode performed flawlessly, and we did not notice any problems with it. The external power mode is useful for powering the unit at the end of a long USB cable, but any noise improvement effects of using external power were too small to tell any difference. Why does it have a 75ohm F-connector when almost all wideband antennas will be designed for 50ohms? Airspy Mini is on sale at $80. The N3 can go hide under a rock. It appears that the regulators that we specified for the supplies were not installed by the manufacturer. This means that when connected to the N3, the voltage coming from the supply will be around 7v, instead of the 5v (+/- 10%) that we recommend for the N3. The N3 will work with this voltage applied, but damage could result to the circuit after a short while, due to heat buildup. We are advising that you do not use the power adapter without adding a +5v low dropout regulator between the power supply and the N3 (something like an LM2940-5) with a modest heatsink on the regulator. We are sourcing new power adapters from a different vendor and will be shipping them to you at no cost when they arrive. Currently, I regret to say, I don’t quite have a timeline on the replacements, but I will keep you informed. Fair play to Thumbnet, I like their attitude, despite the fact that that the laptop is khmmm. This review largely matches my experience. Only problems I’ve had are ones that are basically the same as other RTLSDRs. For example images when listening to weak signals (propagation beacon at 144.295) that are too close to stronger signal (local APRS digis on 144.390 MHz). This is a problem with selectivity and dynamic range and not so much sensitivity or noise floor. Although our market is secondary it would be nice if Rafael Micro were to tighten up its IF filtering if they ever release a successor to the R820T2.